What is recycling or “re-refining” of used oil? And what is not? 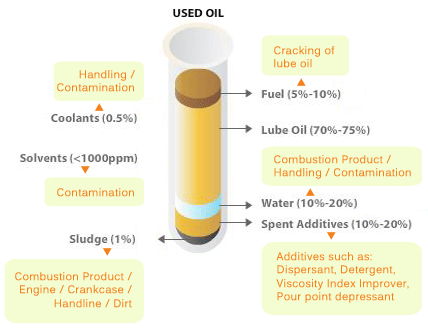 True Recycling (Re-refining) of used lubricating oil means separating the “Lube Oil” from everything else in the diagram above and purifying it to meet International Standards. In short, recover and purify base oil. Filtering used oil to remove solids or drying used oil so it burns better is NOT recycling! Sequoia’s process technology for recycling used lubricating oils is based on distillation, adsorption and hydrotreating processes. Specially designed evaporators preserve oil quality and prevent corrosion and fouling of equipment. Our evaporators have no moving parts and do not require cranes for their cleaning and maintenance. Expect highest product quality and yields, including those for intermediate products and byproducts. For given product quality, lowest capital & operating costs compared to any other technology supplier. Sequoia has reference projects on 4 continents of the world. The cost for electricity, fuel, water, waste water disposal and chemicals will be $15-30 per m³ (US$ 0.06-0.13 per US gallon) of used oil processed. Direct labor will be 10-15 persons. The land requirement for a fully integrated facility will be 1 acre (4000 m²) – 7 acre (28000 m²).